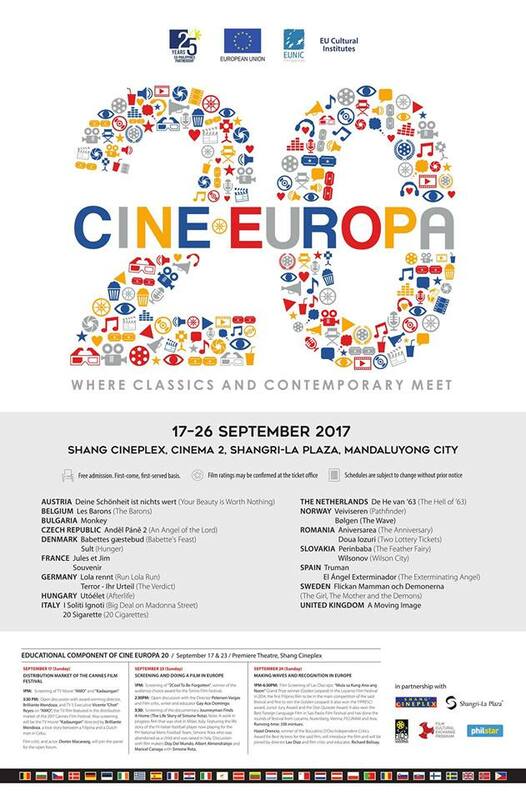 Shangri-La Plaza brings the best of European cinema to Philippine screens at this year’s Cine Europa, which is celebrating its milestone 20th anniversary. 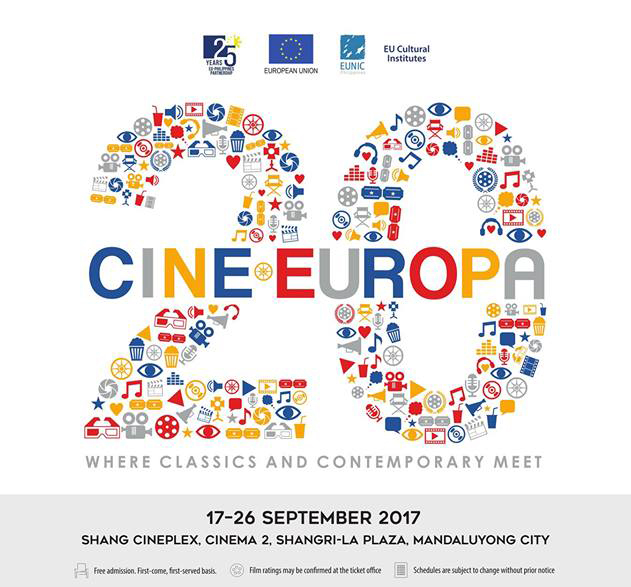 A lineup of 24 dramas, thrillers, and comedies will be showing from September 16 to 26at the Shang Cineplex Cinema 2, with free admission, so mark your calendars and watch these critically acclaimed films. Among the impressive movies at this year’s festival is 1988 Best Foreign Film Academy Award winner Babettes gæstebud (Babette's Feast), which follows the story of Babette, a Parisian fugitive following the 1871 Commune of Paris uprising as she changes the lives of the villagers who take her in.Based on the tale by Isak Dinesen, this Danish film is one that cinephiles shouldn’t miss. Cited as one of the best 1,000 films by The New York Times, Spanish film El ángel exterminador (The Exterminating Angel)is a work of satire, where guests at a dinner party discover they’re unable to leave the room. Over the days that follow, they each slowly shed their perfect façades and pretenses of power to reveal the uglier side of human nature. Sharp and surreal, this is a film sure to leave a lasting impression on viewers. Sult (Hunger), the second Danish film, features a young, penniless poet as he scrambles to survive in Oslo in 1890.Based on the novel by Knut Hamsun, the story follows Pontus as his hunger takes over and the line between fantasy and reality becomes increasingly blurry. German thriller Lola rennt (Run Lola Run)will keep you on the edge of your seat as a two-bit Berlin criminal makes a mistake when he delivers smuggled loot for his boss and must come up with 100,000 Deutschmarks in 20 minutes. He enlists the help of his girlfriend Lola, the daughter of a bank manager, to help him get the money. Afraid that she will lose her lover, Lola runs through the streets of the city in a race against time. In Terror - Ihr Urteil (The Verdict), terrorists have hijacked a plane with 164 passengers and are steering it towards a football arena where there are 70,000 people. Major Lars Koch must make a difficult call as he faces the difficult question of whether the lives of a few are worth sacrificing to save many. Swedish filmFlickanMammanochDemonerna(The Girl, The Mother and the Demons), is the harrowing tale of Ti, whose mother claims that demons have taken over the apartment where they live. However, Ti can neither hear nor see the spirits her mother fears so intensely she’s forced Ti to hide with her in the garbage. Will Ti able to help her mother fight her demons, along with her own? Italian drama 20 Sigarette (20 Cigarettes) follows a young filmmaker who gets caught in a terrorist attack while shooting on location in Iraq. He is seriously wounded and brought back to Italy, where the press has been fed a different narrative from the actual events. Years later, he decides to set the story straight through a novel. Inspired by a legend from the 12th century, Norwegian film Veiviseren (Pathfinder)tells the story of a young boy who sees his family slaughtered by a feared tribe of Tsujudes, taken prisoner by the party, and must act as their pathfinder. The first feature production ever to be shot in the Sami language, the film follows the boy as he attempts to escape his captors. Also from Norway is Bølgen (The Wave), which takes place shortly before the real-life disaster of a tsunami caused by the collapse of a mountain 80 years ago. The film focuses on an experienced geologist and his family as they scramble to stay alive—and stay together. Austrian film Deine Schönheit ist nichts wert (Your Beauty is Worth Nothing) follows 12-year-old Veysel as he flees with his family to from Turkey to Vienna and struggles to fit in. To cope with the fear of deportation and the tension in his family, Veysel turns his attention to his studies, as well as towards Ana, a classmate he’s in love with. Academy Award-nominated actress Isabelle Huppert stars in French film Souvenir as a forgotten European singer who fades into obscurity as she works in a pâté factory. However, the arrival of a young aspiring boxer causes her to start dreaming again and planning her comeback. An atypical romance takes to the screen in Jules et Jim (Jules and Jim), a French tale of two close friends who become entangled in an offbeat love triangle. Jim moves in with his friend Jules and his family, but things get messy when Jules asks Jim to start seeing his carefree wife Catherine in the hopes that she will stay at home with him and their daughter. In Monkey,two adolescent half-sisters get a taste of the real world as they make decisions that could dramatically change their lives. Catch this Bulgarian coming-of-age film to see if Iva and Maya learn to walk the line between the carefree life of a child and the tough choices of a grownup. With his final days drawing to a close, terminally ill actor Julián is surprised by an unexpected visit from his childhood friend Tomás. As they set out to tie up loose ends, including finding a home for Julián's faithful dog, the two men must find a way to say goodbye. Don’t miss the award-winning Spanish film Truman. From the United Kingdom comes A Moving Image, a film about Nina, a young stifled artist who returns to her community after a long absence. Soon painted as a symbol of gentrification, she struggles with her own complicity, and embarks on a mission to create a piece of art that can bring her community together. Drawing inspiration from paperback crime novels, Wilsonov (Wilson City) follows an unlikely pair of detectives as they search for a mysterious murderer in a German town that would eventually be known as Bratislava. Based on the territorial disputes that followed the end of WWI, this Slovakian film will capture the attention of history buffs and adventure seekers alike. Some family issues prove to be too difficult for even death to resolve, as seen in Utóélet (Afterlife). In this comedy from Hungary, a heavily neurotic man starts seeing the ghost of his recently deceased father. As Mozes helps his dad cross over to the afterlife, the two must work out their unfinished business and discover how to truly understand each other. Romanian film Aniversarea (The Anniversary) zooms in on family drama as well when relatives and friends of Radu Maligan comes together to celebrate his 94th birthday. The party quickly unravels into a complicated mess when half the guests try to convince him to confess his sins to a priest, while the others argue that no one should be forced to do something beyond their will. Another film from Romania is Doua lozuri (Two Lottery Tickets), where the tables keep turning on Dinel as he catches a break from his unhappy life by winning the lottery. Unfortunately, the bag with his ticket ends up stolen by two gangsters. With the help of his best buddies, he sets off on a madcap journey to chase them down. Don’t miss the story of Hassan, a baron who wants to do more than just lounge about. However, his dreams hit walls, from his inability to approach his friend’s sister whom he loves, to pursuing a career of making people laugh. Hailing from Belgium, Les Barons (The Barons) is packed with great laughs and lighthearted fun. Crime meets comedy in 50s Italian masterpiece I Soliti Ignoti (Big Deal on Madonna Street), where a group of small-time thieves attempt to burgle a state-run pawnshop in Rome. Known for its incredible cast and breezy jazz score, this film is considered one of the best of its era. Lovers of fantasy are in for a treat with Anděl Páně 2 (An Angel of the Lord), a comedy from the Czech Republic that follows Angel Petronel’s quest to retrieve fruit of the Tree of Knowledge that has fallen down to earth. His adventures lead him to discover the power of friendship, love, and forgiveness, and are sure to be fun for the whole family. Perinbaba (The Feather Fairy)is a charming Slovakian adaptation of a short story by the Brothers Grimm. The Feather Fairy rescues and raises a little boy named Jakob. Though his life is perfect, Jakob begins to yearn for a life outside of his perfect fairytale—especially when he falls in love with a peasant girl. Sports enthusiasts will love De He van ’63 (The Hell of ’63), which is based on the true story of the fateful day in 1963 when thousands of skaters were injured as they competed in the infamous 200-km ice-skating race in the Netherlands. Despite the freezing temperatures and rough terrain, a small group refuses to give up and decides to press on towards the finish line.